With summer finally here, many of us will inevitably spend a weekend or two, and possibly more at the beach. I’ve stayed on the Long Island Sound over the past few weeks, and although I love the sun and sand, I can’t help but think about how I’d redecorate the house’s not-so-beachy bedroom. When I went browsing for bedroom ideas, I found the rooms below, each beachy and summery in their own fashion. I was attracted to the ship blueprint photos the moment I saw this photo. 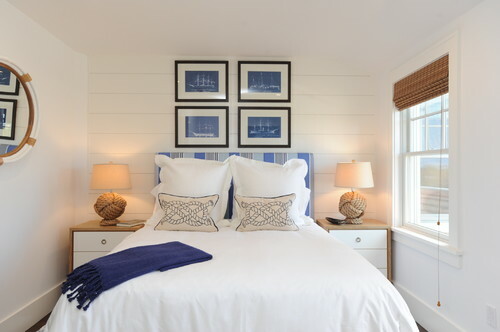 This compact bedroom boasts the aesthetic of a coastal retreat with its white walls and bedding, not to mention the blue accents. The rope lamps add a nautical touch. 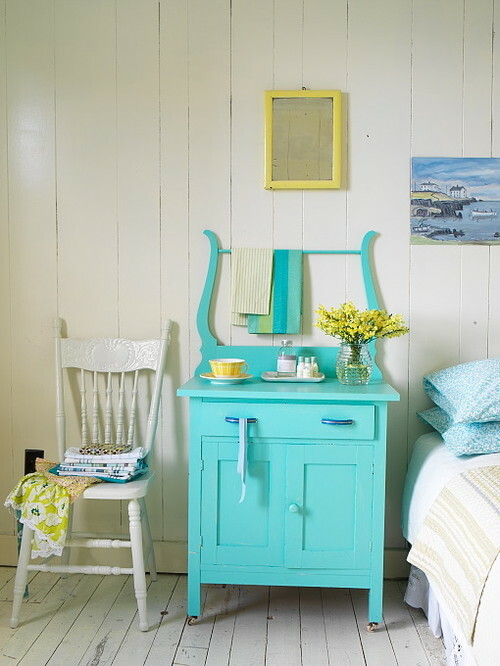 I can’t help but admire the paint color on the bedside table/cabinet in this cute coastal room. Simple white paneling sets the tone for this beach bedroom, while yellow lends punch and complements the aqua and white color scheme. Although designed as a child’s bedroom, if you remove the toys and stuffed animals, this space could easily convert to a comfy even somewhat sophisticated grownup bedroom. The furniture is simple and modern, as is the bedding with a gray and white awning stripe. The art above the bed is completely coastal, don’t you think? 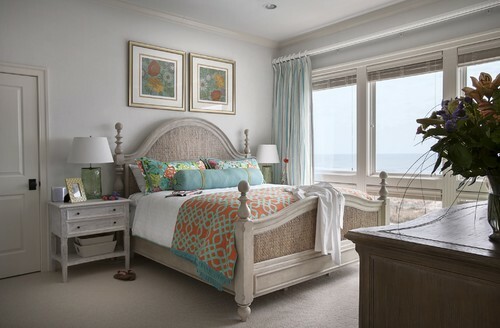 Traditional with elegance, this graceful bedroom overlooking the sea would make an ideal guest quarters. The chunky, upholstered bed is a good match, but the Alexandria Bed from Charles P. Rogers would do nicely in the room too.